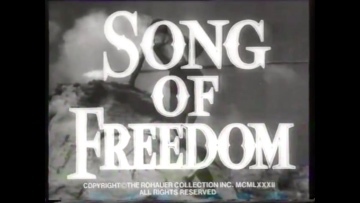 The film is a musical star vehicle for Paul Robeson. It opens with the on-screen information “Africa – the island of Casanga, off the West Coast – in the year 1700 A.D. The island had not yet attracted the attention of the slave traders on the mainland, but its people suffered as fierce an oppression under their hereditary queen Zinga – tyrant, despot, mistress of cruelty” After a short prologue, in which the wicked queen’s son and his wife make their escape from the island and are taken into slavery, the action transfers to modern day London. There, John Zinga (Paul Robeson) works as a docker. A gentle giant with a magnificent singing voice, his talent comes to the notice of operatic impresario Donezetti (Esme Percy). Soon, John becomes a world-famous singer, but, tortured by thoughts of his roots, he eventually gives up his new career and determines to use his fortune on finding his real home and helping his own people. Will Hammer (Anthony Hinds’ father) and George Mozart, who both appear in this film, were among the original founders of Hammer Films. Production supervisor H. Fraser Passmore was also on the board at this time. The Director, J. Elder Willis, worked on later Hammer films as Art Director.